Over the past three years, Primedice became one of the most popular and trusted bitcoin-based games in the world. Regardless of this fact, some things are wrong with it, that’s why a lot of people are searching for other dice sites like Primedice. Design wise, the website features attractive colors and responsiveness over all sorts of mobile devices, but they missed one of the most important factors which inevitably caused me to switch to a different site. The fonts. They are blurry, and my eyes hurt when I read anything on this website. Take a look at the image, and you will know what I mean by blurry. Personally, this sort of thing is so off-putting for me, that I simply do not waste any more time on a website which features tear-producing, barely readable text like this one. It’s the little things that matter the most and Primedice has a lot of small problems that cause them to lose players consistently. When looking at the game, it’s pretty simple! As a player you get to choose your payout and the game sets your win-rate accordingly. The games also include the standard Auto Bet features, which allow you to modify and experiment with different payment structures, because of the conditional instructions that you can use to adjust the bet after each win or loss. Overall, the game is great, especially because it features a nice house edge of only 1%, which guarantees 99% RTP. 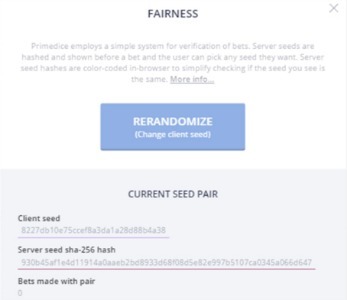 On the other hand, most crypto-players tend to make money through their referrals, for which Primedice offers a pretty weak deal. Their affiliate program provides 10% of the house edge on bets, which effectively earns you 0.1% of any bet made. Sure this can stack, but many other casinos are offering much better deals, such as 15% on direct referrals, 10% on second level referrals and even 5% for referrals beyond that point. The percentage represents house edge, so depending on this information you can quickly calculate potential earnings with any casino on the market. 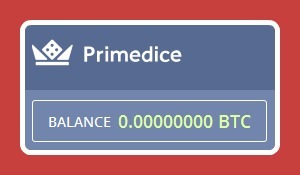 Another feature on Primedice’s website is the levels and faucet systems, which offer a small boost to your balance every 3 minutes, but only if your balance is zero. It’s simply a way for people to test out the game before they decide to stake their money and gamble away. As a player, you get to earn levels every time you wager, and as a result, you can get more Bitcoin from the faucet every 3 minutes. The achievements are pretty demanding, with the first level becoming available once you’ve wagered at least one full Bitcoin, regardless if you’ve won or lost. If you’ve been thinking about switching to a different Primedice alternative, go ahead. You should consider what kind of benefits you will get by switching it up, though. If you like attracting people to a website you should consider www.Crypto-Games.net, because of their high commission paid out. They pay 25% of their house edge, to the individual who referred the player. Compare this percentage to the one Primedice is offering and you will see the exactly what the benefit is. Opportunities are constantly created on the internet, and we as individuals need to continue our active participation in websites that offer a better incentive for our gambling activity, as through these choices we drive this particular market to compete with itself. Successful businesses listen to the customer, and they hear their pain, and this stands true even in the Bitcoin economy. It might be even better, as the different payment option causes providers of goods and services to invest more and more attention to their clients. What I’m trying to say is that all of us should spend the time to research our casinos and compare them with each other before we decide on where to deposit. It might seem like a trivial thing, but you’re inevitably going to invite your friends to come with you to that online casino where you play, so why not get the most out of that particular opportunity?